I wrote a post about my Year in Review as it relates to writing. I went back to see how many Fridays I successfully posted in 2014 and the number was 20. This makes 21. I’ll try to do better in 2015 – I miss it! This image doesn’t immediately tell me a story, but I’m going to stare at this page until one decides to show up. Wait for it. He’d been reading about flea circuses, how fleas were harnessed with little copper wires they wore their entire life. If you stuck a flea on its back, laid a tiny guitar across its legs, and held a candle to it, it played the strings as it wiggled to escape the heat. He gathered a handful from the dog and put them in an old cigar box. He’d hook up the copper wires later. The next morning, he couldn’t find the fleas. He sure was itchy, twisting and scratching. He looked like a puppet on a wire himself. A regular circus act. The first records of flea performances were from watchmakers who were demonstrating their metalworking skills. Mark Scaliot in 1578 produced a lock and chain which were attached to a flea. 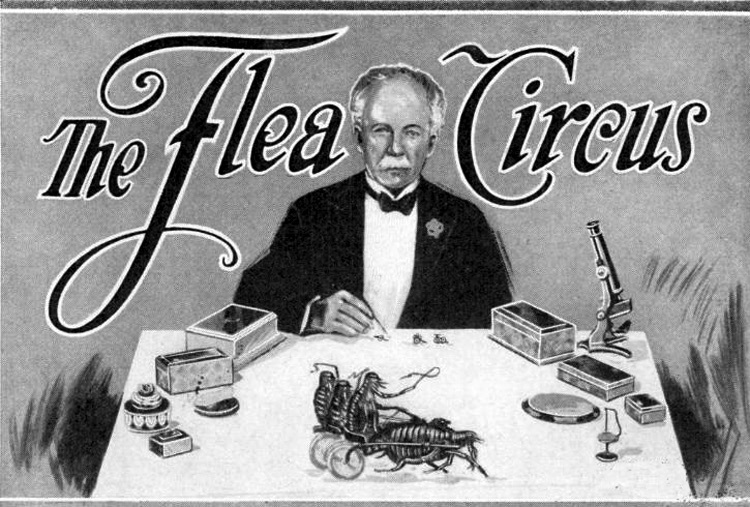 Flea performances were first advertised as early as 1833 in England, and were a major carnival attraction until 1930. Some flea circuses persisted in very small venues in the United States as late as the 1960s. The flea circus at Belle Vue Zoological Gardens, Manchester, England, was still operating in 1970. At least one genuine flea circus still performs (at the annual Oktoberfest in Munich, Germany) but most flea circuses are a sideline of magicians and clowns, and use electrical or mechanical effects instead of real fleas. Way to stick with it until a story emerges. I enjoyed this one. Funny–I thought about a flea circus when I first saw the prompt but couldn’t come up with a story to tell. I’m glad you found one. I was itching to get to the end of this story. I felt sure you were heading down the track to where the fleas turned out to be The Beatles. Great take on the prompt Erin, and congratulations on your progress this year. I’m glad I could be of service. I remember reading about flea circuses as a kid and thinking it sounded like a terrible idea. They are not my favorite thing. Thanks- I had to think about that one for a while! Way to persevere. I like the double twist you served up with your story, bringing the whole thing full circle. Very well done. Thank you for reading – and hope all is well in your world. I’ve never seen a flea circus, although I had a dog who could’ve contributed to all three rings. Those little suckers bite. Love the history lesson at the end. Nicely done. Thanks, Rochelle. I am decidedly slow in responding and reading – and of course, this week, when I have time to do FF post, we are taking a much deserved break. Thank you for all you do by hosting the group – you are dedicated, devoted, and delightful, I appreciate it. That’ll teach him. I can’t imagine someone taking the trouble to set up a flea circus – guess it takes all kinds. 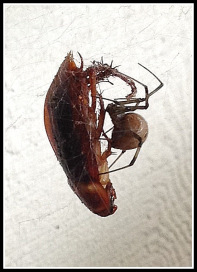 I’m happy for those escaped fleas. Good story. Thank you! I have been slow to read others but will take a turn now. Happy New Year!